"The Roku digital video player (also known as the Netflix Player by Roku) instantly streams high quality movies from Netflix and Amazon Video On Demand from the Internet -- directly to your TV." A couple of months ago when my husbands hours were cut at work we cut back on anything we could to save money. One of the first things I cut back on was our cable, I got rid of all of our pay channels and our 2 DVR boxes. We started renting movies from the local video store about twice a month but I hated having to make sure they were back on time and since I have a little one sometimes I just could not watch them before they had to be returned. I decided to check into Netflix since they mail you the movies and do not have a set date to be retured( they just send you the next one on your list when you mail one back). The only thing is our mail is not delivered to our house and I would have to make a trip to the post office just like I would to the video store to pick up and return. 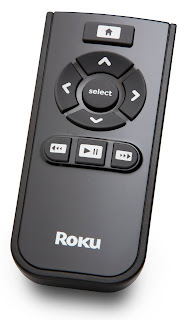 While looking into Netflix I came across the perfect solution for our movie watching....... the Roku. Roku has teamed up with Netflix to offer customers the ability to instantly watch more than 12,000 movies and TV episodes, including new releases and hundreds of options in HD, streamed directly to your TV. The best part, if you are like most Netflix customers and on a Netflix Unlimited plan (any plan that costs $8.99 a month or more); there are no limits to how much you can watch instantly. When I received the Roku I had my Netflix account and Roku set up in a matter of minutes. The player co mes complete with everything you need to get connected right away. 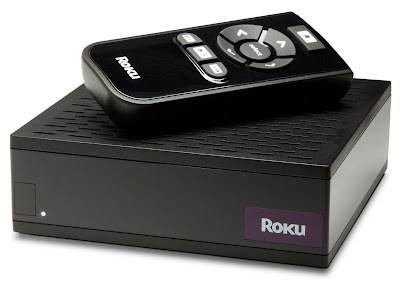 It even includes the standard yellow, white and red cables.You connect the Roku player to the Internet using most broadband providers (such as a cable modem or DSL connection).Use the built-in Wi-Fi capabilities to connect to your wireless network, or use the Ethernet port for a wired connection.The Roku player is easily controlled using the handy included remote. To watch a movie is EASY just use the Netflix site to browse a growing library of over 12,000+ instant movies and TV episodes – including hundreds in HD. Place choices in your Instant Queue, add more whenever you want, and keep them as long as you like. Then use your remote to browse your Instant Queue and choose something to watch. Pause, fast-forward, rewind, or watch a favorite over and over just like owning a DVD. 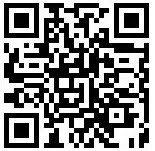 If your family enjoys movies the Roku is a must for your home. Roku is available online at Roku.com for $99.99. I could see getting addicted to that watching tv episodes. I want one of those for our house. I like to watch movies when I have time.